When it arrived, it was a lot smaller than I anticipated, which was a good thing since I wasn’t too keen on eating a giant bowl of quinoa soup. Honestly, quinoa never sounds too exciting to me, and I was a little weary of trying this new broth bowl out because of that. I ordered a small salad as well (review for that coming later this week!) and got a little baguette for my side item. Really pleased that the hard-boiled egg stayed together through the delivery process. I was afraid the yolks would fall out and get lost in the broth, but they arrived perfectly halved. The kale was soft, but still had a bit of crunch. I was initially really happy about the little lemon slice. Later I grew to dislike after the whole broth turned sour from the lemon juice. Definitely shouldn’t have let it sit in the bowl the whole time. Lesson learned. I let my husband try some toward the end of it and he hated it. He thought it was really bitter. I blame the lemon slice. There were not as many lentils or quinoa in the broth as I thought from the site’s photo, but I was glad that was the case. More room for me to dip the baguette piece into the broth and soak it up. I liked this broth bowl. If it didn’t have the egg and baguette along with it, I wouldn’t like it as much. 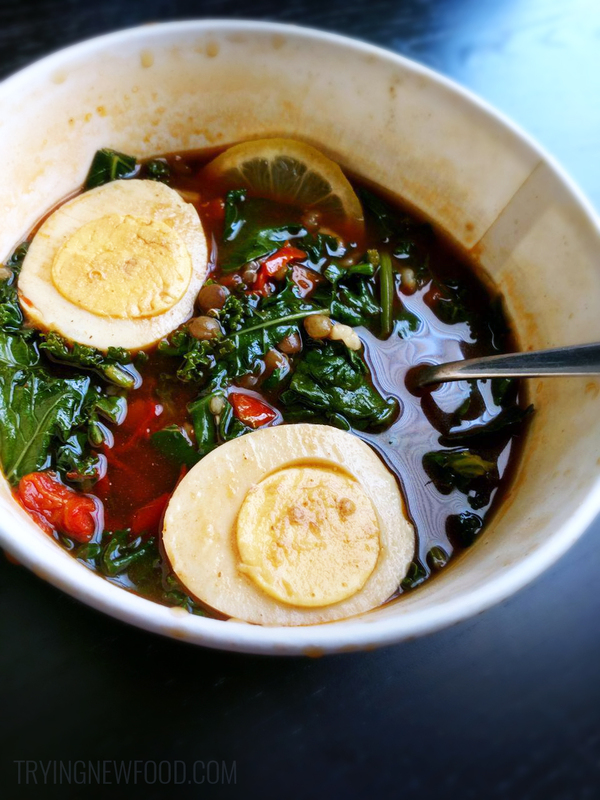 Have you tried the Panera lentil quinoa broth bowl with cage-free egg? Let me know what you thought!